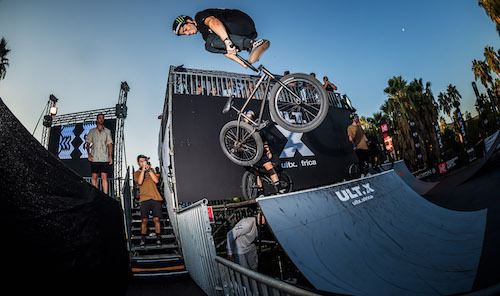 Sun City – It was another incredible BMX event last weekend, with ULT.X taking place at the Sun City Resort. 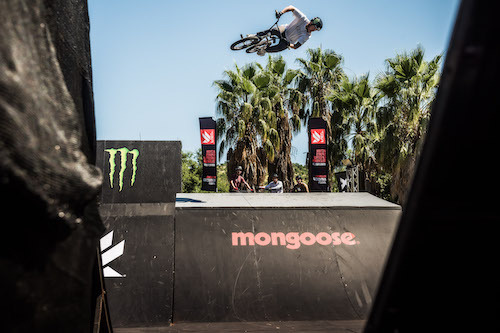 Monster Energy’s Pat Casey, Kevin Peraza, Ben Wallace, Alex Coleborn and Mike Varga were all in town and certainly hungry to win in this event, up against a huge line-up of riders from almost every continent. 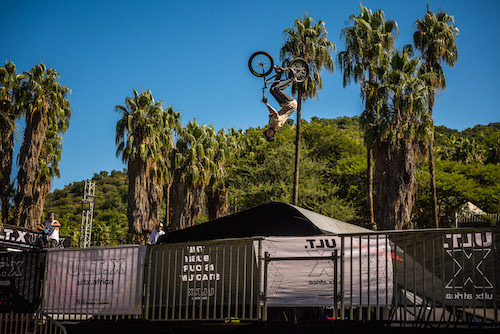 The super fun and tight setup at Sun City definitely pushed all the riders to think out of the box, with a lot of emphasis put on catching transition as smooth as possible, without putting in too much pedal exertion in between the ramps. Our boys made light work of it, resulting in a full Monster Energy podium sweep from Pat Casey, Bryce Tryon and Kevin Peraza. Mike Varga and Ben Wallace wasted no time kitting up to lock in some big lines on the park. Wallace, blasting his signature cranked lookbacks and downside whips, as well as some new Can-Can 360 variations, impressing spectators and competitors alike. Fresh off a 2nd Place finish at The Night Harvest in Cape Town, Varga braved the 35+ degree heat and put in some solid runs, packed with his magical bag of tricks, like stretched Superman whips and tons of crazy looking spins and under flip transfers, ending him just off the podium in a the 4th Place spot. The nicest guy with the biggest smile in BMX, always doing the wildest tricks with the biggest smile on his face, Kevin Peraza definitely brought the most original lines to the contest this year. From 270-downside whip drop-ins, nose-bonk combos for days. Not forgetting those crowd-pleasing Superman seat-grabs and 360 whips, to tables. Kevin is the man, and it was great to have him back in South Africa after missing the contest last year. Current man-of-the-moment, young Bryce Tryon is currently on a contest-destroying warpath, climbing higher up the ranks after each event he enters. The setup and Bryce’s style seemed to gel well together, with plenty of opportunities for transfers and alley-oops, Bryce used the park to his full advantage, squeezing in bar-spins where they shouldn’t be possible and lacing runs packed with tricks from start to finish. It looks like 2019 is going to be Bryce’s year. Pat Casey is an absolute beast, charging at everything he does with 150%. After taking a couple of brutal slams in practice while figuring out some crazy looking front-flairs. Pat got them dialed in and proceeded to annihilate the entire setup. His winning run was impressive, packed with variation and big tricks that he is known for. The tight setup slightly resembled his enviable backyard ramp so he had no problem completely ruling it. Click HERE to submit your Durban / Kwazulu-Natal Press Release. Next: Celebrate reggae this April at Wahooz!